Two terrific collections of romantic selections perfect for any Wedding! Featuring Be Thou My Vision, Flower Duet, Wedding March, Clair de Lune and many more! 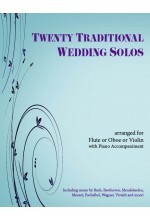 For more Wedding Music we publish 20 Sacred & Spiritual Solos as well!